Club Brugge won their third game in the Belgian First Division A handsomely after beating Kortrijk 3-0 at Jan Breydelstadion on Friday night. 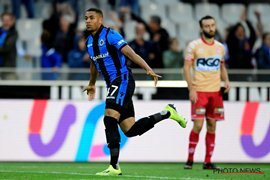 Nigerian-born Netherlands U21 star Arnaut Danjuma helped Club Brugge take the lead as early as the third minute when he dribbled past his marker before firing a curling shot past the goalkeeper. In the eighth minute, Danjuma doubled the lead with another shot from inside the 18-yard box after breaking clear. The 21-year-old left midfielder has been directly involved in four goals (2 goals, 2 assists) in four appearances for Club Brugge in all competitions in the new season. Sixteen minutes from time, Danjuma was replaced by former Nigeria schoolboy Emmanuel Bonaventure Dennis, while Kortrijk's number eight Abdul Ajagun was substituted in the 79th minute. Up next, Club Brugge, who have a one hundred percent record in the league, travel to Antwerp on August 19, a day after Kortrijk's meeting with KV Oostende.